A rare traditional wooden coaster built by the National Amusement Device Company in 1958. Big Dipper is Camden Park's headline attraction, and was built by National Amusement Device Company in 1958. It replaced the park's first rollercoaster, New Sensation, which had operated between 1912 and 1957. Rumours suggest the ride is haunted by a woman, whose ghostly figure is sometimes seen riding in the back car. 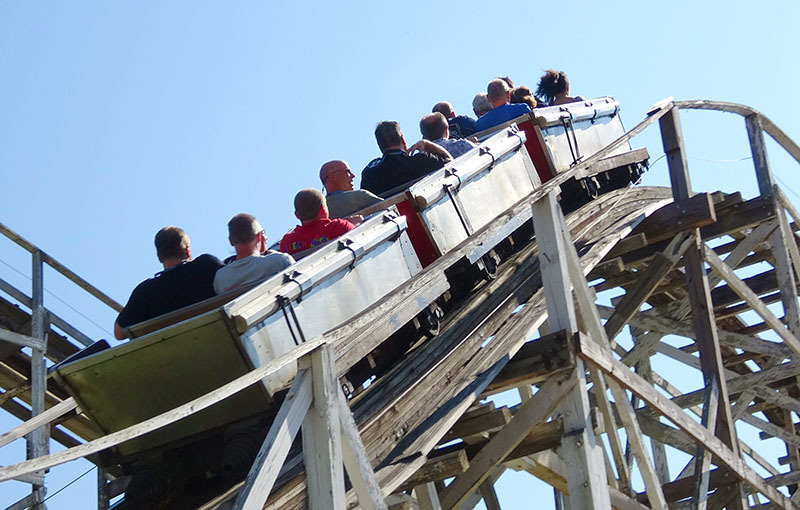 It is one of very few examples of National Amusement Device Company rollercoasters still operating, and Camden Park is the only park to have two: the park's Lil' Dipper wooden kiddie coaster was also manufactured by them. The ride uses two of National Amusement Device Company's Century Flyer trains, which are known for their shiny metallic bodywork and working headlights that are powered by batteries housed in the ride cars. The train comprises three cars, each with three rows of two riders. With their traditional lapbar restraints and absence of seat dividers, they allow for a lot of airtime! The ride on Big Dipper begins with the train leaving the station and ascending the chain lift hill. At the top is a small drop, and then a 180 degree corner. Unusually, the rollercoaster's largest drop comes second. This is followed by another 180 degree turn, and a drop into a long dark tunnel. Exiting the tunnel, the track continues diagonally across the ride area, delivering the train into the brake run and back to the station where a staff member on the platform uses the manual brakes to bring it to a halt. Big Dipper is a good ride, although it is in pretty poor condition. Its rough in places, the wood has warped and the white paintwork is flaking off badly. As with much of Camden Park, it feels like it could do with a bit of love and attention.